If waiting for your PC to boot-up feels like an eternity a company called Soluto aims to reduce the wait. 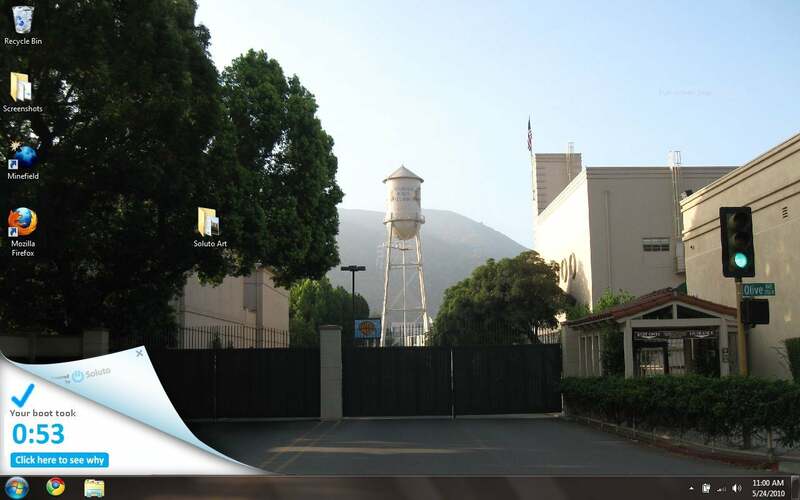 On Monday the company introduced a unique PC utility, also called Soluto, designed to speed up the boot times of Windows XP, Vista, and Windows 7 systems. The program, available now in beta, gives you an at-a-glance view of your startup programs and how much time they are adding to your overall boot time. Using Soluto, you can either select just the programs you want launch or choose to have programs startup in the background later. In my informal review of the beta Soluto I was able to cut the startup time of two of my PCs in half to just under one minute. Soluto, a small startup based in Israel, introduced its product at the TechCrunch Disrupt in New York on Monday. The company says the Soluto utility is just a start. Phase two for the Soluto service is to monitor your PC, detect slowdowns and software conflicts, and share that data with millions of other Soluto users via what it calls a PC Genome. Lastly, Soluto will use the collective data of other PC users to suggest an easy fix for what ails your system. Let's take a closer look at the beta Soluto utility. 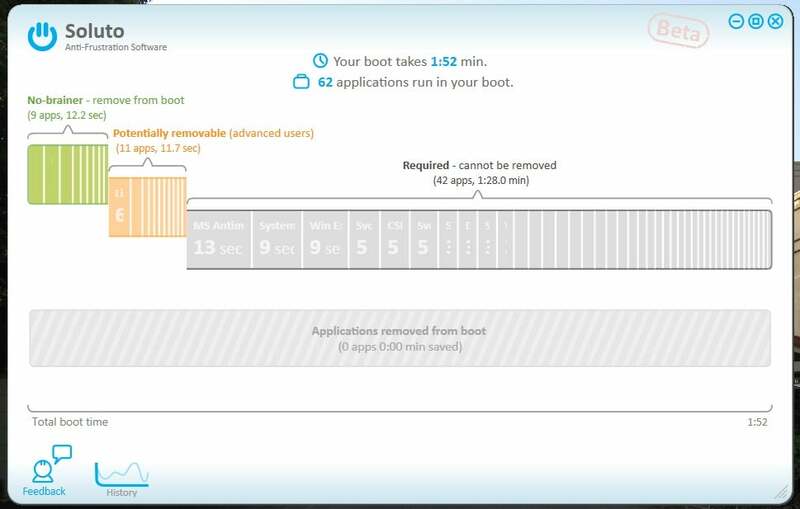 Soluto shows you your boot time and processes every time you startup. You can disable this by right-clicking on the Soluto icon and deselecting "Live Boot Progress." Soluto categorizes your boot applications into three categories: no-brainer (you can turn them off), potentially removable and required (core system processes that Soluto won't let you touch). Each time you select a program in your boot list, Soluto will offer a recommendation for whether you should Pause (remove from your boot) or Delay the application. 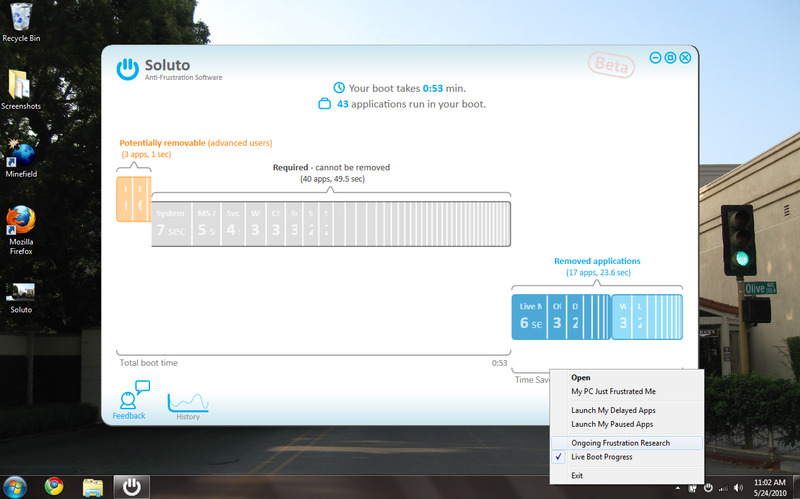 If you choose to delay an application, Soluto will wait after startup until your computer has enough processing power available before launching each delayed app. Soluto's real hope is to expand its boot-up utility and extend the program's capabilities combining statistical analysis of millions of other PC users with good old-fashioned crowd sourcing. But Soluto won't be like crowd-sourcing poster child Wikipedia -- where users contribute directly to a knowledgebase. Instead, the Soluto utility runs in the background on your computer--and the computers of many others--and monitors how you interact with your PC and deal with problems that arise on your PC. For example if you find a fix for your browser that crashes because of incompatible browser plug-ins Soluto sends a report of the problem and your fix to its PC Genome master database. If someone else is having the same problem, Soluto will be able to offer a fix. The basic idea is, if a user in Detroit solves a problem with their computer, Soluto remembers that solution, and distributes the fix to someone in Chicago dealing with the same issue. "Soluto gives you the knowledge to make smart decisions about your computer," Roee Adler, Soluto's chief product officer told me during a recent visit to the company's offices. Even though most of Soluto's crowd sourcing is done automatically, Soluto does have a wiki component for users to contribute descriptions and recommendations about boot processes. 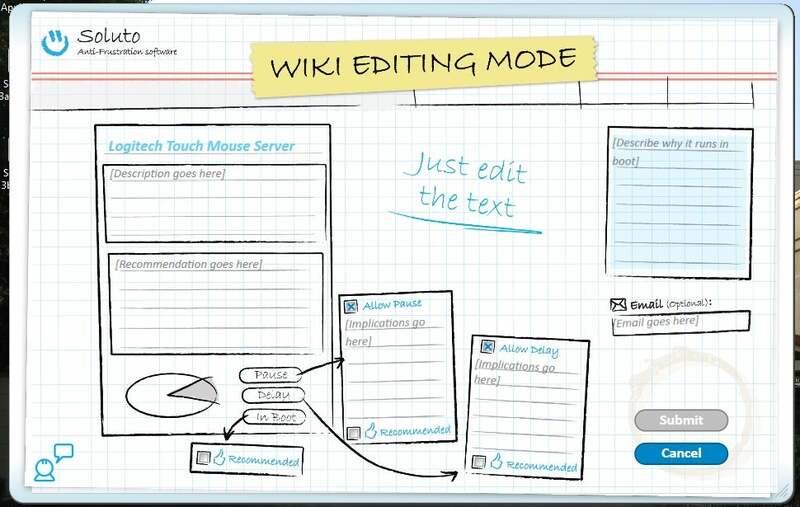 All wiki contributions are reviewed by Soluto before they are published. To let Soluto log your data and contribute to the PC Genome, right click on the Soluto icon in the system tray on the right side of your screen and select "Ongoing Frustration Research."